Imagine that your boss calls you in the morning with an urgent task. For example, he asks you to create some slides for a meeting he will attend in 2 hours. The production of your company stops. Or a user tells you that there is a bug in your software that is blocking his work. Unexpected and urgent tasks exist everywhere. No matter if you are working for a Fortune 500 or a medium-sized company. From my experience, we spend our time rather on urgent tasks than on important tasks that will help us to achieve our goals. Urgent inquiries usually make me lose my focus, mess up my schedule or even my whole week. Especially bigger interruptions, those that require me to change my plans, make me struggle. On the opposite, Scrum tells that we should respect the sprint and not change our plans. Clearly, changing plans too often will reduce productivity no matter if you are a single developer or a team. As a product owner, I felt overwhelmed to make the decision whether to take up a problem or to keep the sprint plan (usually created the day before in the worst cases). Unfortunately, urgent work is hard to avoid. It gets even worse: We never know when it will come up. The conclusion of this is ironic: Understanding how to deal with urgent work is an important issue. Like it is obvious to fix the hole in the rabbit hutch before you catch the rabbit and put it back in. … deal with interruptions calmly. … think more about how to avoid interruptions. … increase your focus on your important tasks which will lead to better results. This is visualized with the Eisenhower Matrix by asking the two main questions: 1. Is this task important? 2. Is this task urgent? Important tasks help you to create a value for your users. In contrast, urgent tasks usually help others to achieve their goals. They will result in immediate (sometimes harsh) feedback. How would you rate the following examples? Task 1: Hire an intern to automate your software test. Task 2: Execute new release test for a new release of your software. Task 3: Create new training slides and a user manual for the new tool you developed in the last weeks. Task 4: Provide personal support for an user. Task 1 will save you a lot of time in the future as you don’t have to execute your software tests manually. Additionally, the test will be executed more often and will increase the quality of your software. If you can’t do it yourself, hiring somebody is surely an important task. In comparison, Task 2 seems more urgent. You worked hard on implementing new features into your software and only the last tests are missing. This is currently the only thing that stops you from delivering value to your customers. Certainly, this is an important and urgent task. Task 3 has the intention to show that not only new features are important. For example, complex software for tax advisors with very good online training will be perceived more helpful. Task 4 is one of those urgent things that sometimes have to be done. If you cannot avoid it, make the best out of it and use the time to understand your user’s needs. It will create a good relationship with your user. In case it happens regularly, think about how to reduce this time, e.g. by doing Task 3. Important but not urgent tasks: These are your top priorities! Important work will avoid urgent work in the future. Important and urgent tasks: Usually, these are top priorities for others. Urgent but unimportant tasks: Do only those things you cannot avoid. Look for patterns. Everything that avoids urgent work is important work. 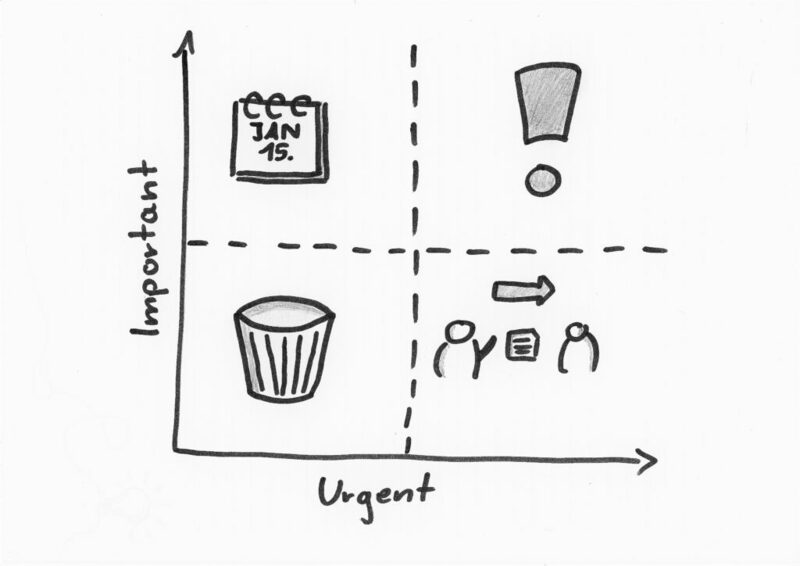 Unimportant and not urgent tasks: While writing this article I had no ideas for this category. Do you have something in your mind? Write comment! Anyway, working on such things is the worst we can do! You can train yourself to recognize important tasks already on a daily basis. Write down the things you need to do on the next day before leaving work. Then come into the office and do those things right away. Doing this exercise, you will think more about your important tasks. In addition, it will give you a motivation boost because you will accomplish your most important tasks much earlier. Good One 🙂 looking forward for more Posters !